Sunshine Tavern continues its popular Beer Camp this coming Saturday. This time around, Lompoc brewer Bryan Keilty will be walking campers though an afternoon of beer tasting, to be followed by a three-course meal complete with beer pairings. The beer list will include: Kick Axe Dry Hopped Pale Ale, Batch 69 Baltic Porter, Bob's Memorial Braggot, Centennial IPA and Bourbon Barrel Aged LSD. 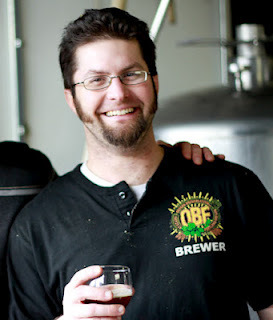 Keilty has been a brewer at Lompoc since 2007. He worked briefly at McMenamin's prior to joining the Lompoc team. Among other things, Keilty is the creator of Lompoc seasonals Flower of the Gods, Saazall Pilzner and Franc'ly Brewdolph (a variation on Brewdolph Belgian Red. Festivities start at 4:00 p.m. at Sunshine Tavern on Southeast Division. Cost is $60. If you're interested, definitely call ahead for a reservation. This event will likely fill up.